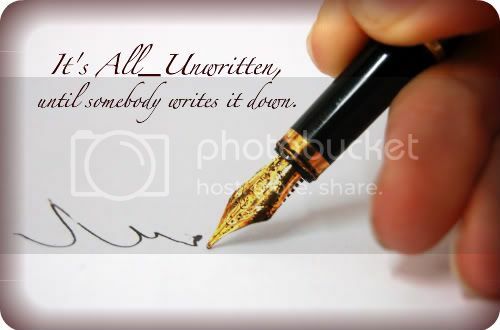 It's All_Unwritten, until somebody writes it down. Following in the footsteps of other great communities, I wanted to create a place where writers could share their work and find inspiration with others. One of the hardest things as a writer is this little thing we call writer's block. Every writer I know flinches at the idea. To combat writer's block I will update the journal with some kind of prompt everyday. Members of the community can use it as a starting point to generate ideas and keep those creative juices flowing. By practicing, stretching our writing legs everyday, and sharing with others for positive feedback and constructive criticisms we can keep our writing alive and sparking. 1) Be polite to your fellow writers. Opinions and inspirations differ from person to person and we need to respect and celebrate those differences. I would like this to be a relatively free place for expression and so everyone just behave. 2) Keep the posts appropriate. If you feel the need to write something adult rated then please do but just don't post it. Use your own discretion here but this is not meant to be a NC-17 rated community. If you write something with "bad language" or other adult content then please post a warning in the subject line as to not offend anyone. 3) Please keep your posts your own. We all borrow ideas as writers and artists but please don't plagiarize another's work. If it is apparent that a post is plagiarized I will delete it. If you would like to share another's work then please get their permission and make sure you are not claiming it as your own. I reserve the right to delete comments without notification if rules are broken and if they are interruptions to the community. Please find another place to advertise. If you need to contact me please email me at lady_aduial@yahoo.com. Other than that, you are free to reply to each prompt with whatever you are inspired to write; fiction, poetry, lyrics, blurbs, freestyles, whatever comes to you. We want to see it all. This is a comment based community. You are invited to share your writing by commenting on the posts. Of course, if the prompt of the day doesn't inspire you, you are always welcome to share other general writing. Although anyone can join and comment, I am the only one who will be able to post the prompts. Anyone is free to reply to them. Thanks! I do not own the rights to any photo used as a prompt. Good luck to everyone and enjoy yourselves!